An explosive new memo details one of Mark Zuckerberg’s most trusted executives attempting to justify growing concerns over the company’s data collection methods, and its relentless push to acquire new users. Titled “The Ugly,” the memo has never been circulated outside of Facebook’s offices until today, when Buzzfeed News got its hand on it. 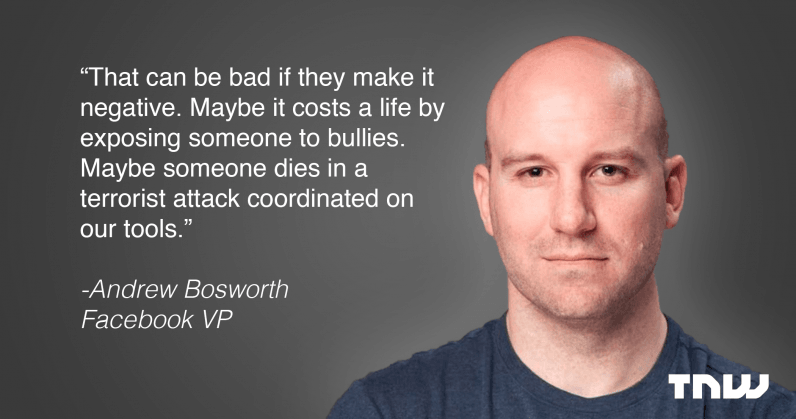 The memo, penned by Facebook Vice President Andrew “Boz” Bosworth, attempted to push a narrative where the ends certainly justified the means in regards to doing whatever it takes to ensure future growth, even at the expense of user privacy. The ugly truth is that we believe in connecting people so deeply that anything that allows us to connect more people more often is *de facto* good. It is perhaps the only area where the metrics do tell the true story as far as we are concerned. The memo was circulated internally a day after the shooting death of Antonio Perkins, a 28-year-old Chicago man gunned down while live streaming on Facebook Live. The 14-minute video featured Perkins drinking and enjoying the company of friends on a sidewalk. Six minutes later, there are gunshots, screams, and Perkins was dead. As for Boz, he defended the action today on Twitter, stating “I don’t agree with the post today and I didn’t agree with it even when I wrote it.” The memo, he said, was meant to spur debate around hard topics and “consider even bad ideas, if only to eliminate them.” You can read his full statement below. Boz is a talented leader who says many provocative things. This was one that most people at Facebook including myself disagreed with strongly. We’ve never believed the ends justify the means. We recognize that connecting people isn’t enough by itself. We also need to work to bring people closer together. We changed our whole mission and company focus to reflect this last year. We talk about the good and the bad of our work often. I want to talk about the ugly. That can be good if they make it positive. Maybe someone finds love. Maybe it even saves the life of someone on the brink of suicide. That can be bad if they make it negative. Maybe it costs a life by exposing someone to bullies. Maybe someone dies in a terrorist attack coordinated on our tools. And still we connect people. That isn’t something we are doing for ourselves. Or for our stock price (ha!). It is literally just what we do. We connect people. Period. That’s why all the work we do in growth is justified. All the questionable contact importing practices. All the subtle language that helps people stay searchable by friends. All of the work we do to bring more communication in. The work we will likely have to do in China some day. All of it. The natural state of the world is not connected. It is not unified. It is fragmented by borders, languages, and increasingly by different products. The best products don’t win. The ones everyone use win. I know a lot of people don’t want to hear this. Most of us have the luxury of working in the warm glow of building products consumers love. But make no mistake, growth tactics are how we got here. If you joined the company because it is doing great work, that’s why we get to do that great work. We do have great products but we still wouldn’t be half our size without pushing the envelope on growth. Nothing makes Facebook as valuable as having your friends on it, and no product decisions have gotten as many friends on as the ones made in growth. Not photo tagging. Not news feed. Not messenger. Nothing. In almost all of our work, we have to answer hard questions about what we believe. We have to justify the metrics and make sure they aren’t losing out on a bigger picture. But connecting people. That’s our imperative. Because that’s what we do. We connect people.